Well this is exciting news for the 14th street corridor. Tom Sietsema reported in his weekly chat this morning that two new restaurants are coming to 14th street. Sietsema says Whisk Group and Abdo Development have partnered to bring Italian Shirt Laundry, at 1601 14th St. NW (at Q street) (named after the longstanding dry cleaners that used to be at the location). Italian Shirt Laundry will be a combination pizzeria and bakery. The second restaurant will be Italian Cinema, at 1404 14th St., NW (between P and Rhode Island), will serve pasta, charcuterie and screen Italian films on the restaurant’s roof. The groups hope the restaurants will open sometime this year. Who’s excited? Have you been? What did you think? What are the prices like? 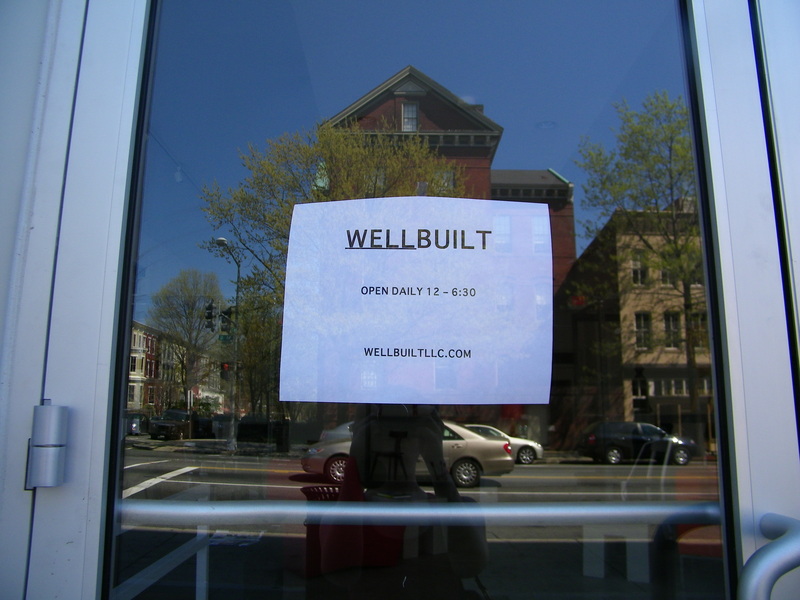 While their hours (12-6:30 Friday through Wednesday and 12-8 Thursdays – according to their website and contrary to this sign) seem reasonable, I haven’t walked by when it’s been open yet. I saw this on Twitter this weekend, but it was way too cold for me to venture and take a picture. So thanks so much to reader Ron for sending me one! 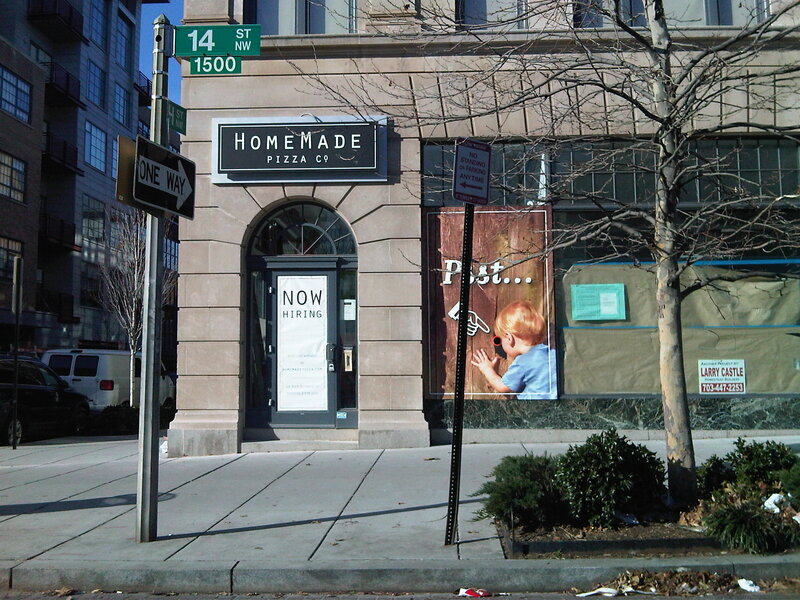 Homemade Pizza Co. on 14th and Church, is scheduled to open Jan. 21st, which is very fast as they just announced they were coming in December. They now have their sign up. Homemade Pizza Co. is a small chain that has other locations in Illinois and Minnesota, and locally in Virginia and upper NW in DC. Has anyone checked out the other locations? Is the pizza decent? Through the end of the year, Plan B, one of the cooler galleries on 14th street, is donating 10% of their gallery sales to Culture Capital, a part of Cultural Alliance of Greater Washington. Culture Capital serves as an online resource for arts and culture events happening in the DC Metro area. The site is basically a one-stop shop that is incredibly easy to use as it is searchable by date, region (includes DC, MD and VA) and event category. Plan B has a lot of great, affordable art in their gallery right now. Prices were as little as $50 for a print, starting at $100 f0r a painting and went up into the thousands. Art is such a great gift to give people, in my opinion, so unique and something that you can enjoy the rest of your life. I went to an event at Plan B for Culture Capital this week and actually ended up winning a Kevin H. Adam painting in their raffle (it’s the Smith Island painting, it’s going to look lovely in my bedroom!). Just my luck, as I really never win anything, let alone raffles, so I was glad I was able to support Culture Capital and Plan B. So stop in, check it out, and buy some art, and the money will go to a good cause! The scene: 6:30 pm on a Friday, at ChurchKey. After spending an hour and a half at the bar, where I saw it go from pretty crowded, but able to get a table for 3 at 5, to so packed I had to squeeze through the sea of people to get to the bathroom, it was time to leave. Before we even finished paying our check, a couple had scored dibs on our table. And, when exiting, I was completely shocked to see not only that the bar was at capacity at 6:30 pm, but there was already a line, at least 20 or 30 deep out the door, waiting to get in. AT 6:30 PM. So yeah, the anticipation for ChurchKey/Birch and Barley was high, and it’s ridiculously popular now that it’s finally opened. Unbelievably so. You’ve certainly seen all the pretty photos of the interior, and heard about the beer list (PDF file). The beer I had was good, the list was nice (though I was surprised how many pretty common beers – such as Brooklyn Lager, Allagash White, and Troegs Hopback Amber Ale they had on draft). The food menu was enticing, but the items we actually ordered we weren’t completely impressed with. We ordered the green eggs and ham (which was actually deviled duck eggs with duck pancetta) – unfortunately we didn’t really like it. First of all, I don’t think they were duck eggs, I’ve bought duck eggs before and they are bigger than chicken’s, with especially bigger yolks. These just looked like regular old chicken eggs. And duck pancetta? I’m not even sure what that actually is, but either way it tasted burnt. However, the arranici caprese we had was quite good. Then again, how can you mess up fried risotto balls? So, yeah, ChurchKey is as ridiculously popular and crowded as you’ve heard, if not more so. If you want to go, go early and during the week. I look forward to trying their sister restaurant, Birch and Barley on the first floor, sometime soon. I’ll be sure to write about it when I do. Gelato, I love it. I love the wider array of flavors, the creamier, smoother texture. I like Dolcezza and enjoy that it’s sold at 14th and U’s farmers market, but have trouble spending $6 for half of a pint. I then saw myself shelling out $6.50 for a large at Pitango Gelato. It ain’t cheap. What was more ridiculous was their $11 and $22 take home sizes. Yeah. This isn’t an everyday place to stop by at (at least for us mortals not making big bucks). But I must say, what I had was good. Pictured, three sorbets: concord grape, white grapefruit, and tangerine, and two gelatos: crema and vanilla chocolate chip. The texture on the sorbet was excellent, not icy or hard like most sorbets you get. The flavor on the concord grape and tangerine was spot on: saturated yet refreshing. The white grapefruit was a little more subtle, and it took me really trying to taste much flavor out of it. The crema and vanilla chocolate chip were solid, but I’d like to taste some of their more inventive flavors as well (chocolate noir, bourbon vanilla, anyone?). While the larges were expensive, they did do a good job of packing it full of gelato/sorbet – they gave me more than I thought I would I get. So the verdict: thumbs up for the flavor, a meh for the pricing. I appreciate it’s all organic but I do wish it were a bit more affordable. It’s a special treat once and a while, not a place to go every hot day when you’re craving something cool. A quick round-up of what’s been happening in the U street area the past few days. I promise a more substantial post later, just been a bit too busy to write one. PoP hear’s some scuttlebutt that the construction on 2001 14th Street will become a 24 hour diner. 14th and You and others report that the long awaited Cafe Salsa is open on 14th Street. Concrete Jungle DC writes about her first impressions on the newly opened Policy.